Will McDonald's Raise Its Dividend in 2019? The Golden Arches have been good to dividend investors in past years. Check out the latest McDonald's earnings call transcript. McDonald's (NYSE:MCD) has a solid year in 2018, posting a modest gain in a year in which the Dow Jones Industrials lost ground. That might have been a bit of a letdown following its 40% jump in 2017, but the fast-food giant remained on course to sustain its impressive long-term performance in providing good returns to shareholders. 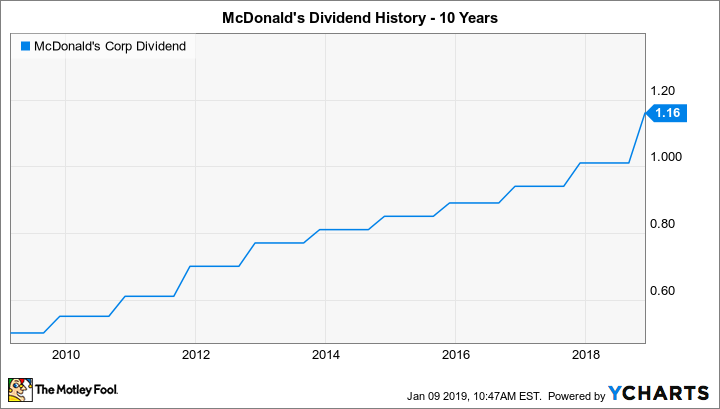 One way in which McDonald's has contributed to its shareholders' success has been in the growing dividends it's paid over time. Since the 1970s, the company has boosted payouts on an annual basis, and with its fundamentals looking stronger than ever, many investors hope that McDonald's will be even more generous on the dividend front. Here, we'll look more closely to see whether McDonald's is going to raise its dividend in 2018. Data source: Yahoo! Finance. Last increase refers to ex-dividend date. With 43 years of consecutive dividend increases, McDonald's has been part of the prestigious Dividend Aristocrats group of stocks for a long time. Moreover, the fast-food giant has never been content to get away with just making tiny increases for the sake of extending its streak. During the 1990s, the company commonly gave increases of high single-digit to double-digit percentages. In the 2000s, when McDonald's moved to an annual dividend for a brief period, the rate of growth skyrocketed. Boosts of as much as 70% lifted the fast-food giant's dividend to impressive proportions. In the span of just seven years, McDonald's saw its total annual payouts rise nearly ninefold. MCD Dividend data by YCharts. Since then, McDonald's has been a bit more conservative in sharing its success through higher dividends. Single-digit percentage increases have been a lot more common, but the company under the Golden Arches did deliver a strong boost of nearly 15% in 2018, reigniting healthier dividend growth. What's ahead for the dividend in 2019? There's a lot of optimism among investors about the fundamental business right now. The company saw its comparable restaurant sales across the globe rise 4.2% during the most recent quarter, and that helped to boost its overall market share in the highly competitive industry. McDonald's has worked hard to keep up with the times, introducing popular concepts such as delivery and digital ordering, as well as offering enhanced features at its restaurant locations. A partnership with ride-sharing service Uber could help spark greater utilization of its delivery option, and self-ordering kiosks promise to make it easier for customers to get in and out of McDonald's locations at the speed they want. McDonald's has also worked to get in line with trends toward healthier eating. The company is using fresh beef in its premium lineup of burger offerings, and it's maintaining a consistent flow of special products that it offers to customers for a limited time. That keeps customers excited about the restaurant chain's menu, and it also bodes well for its ability to identify new trends more quickly so that it can respond with appropriate changes in a timely manner. The one concern that McDonald's investors should have is that tax reform gave the company a one-time profit boost that won't repeat in 2019. Accordingly, with those following the stock expecting more modest 6% increase in earnings per share over the coming year, it seems more likely that McDonald's will revert to the single-digit percentage increases it's done throughout much of the 2010s. An increase to an even $1.25 per share on a quarterly basis would represent an 8% lift, and that would be enough to satisfy investors who've liked the combination of dividend income and strong share-price gains they've seen in recent years.